Mykonos is located in the northeastern Cyclades and is 94 nautical miles from Piraeus and 71 from Rafina. 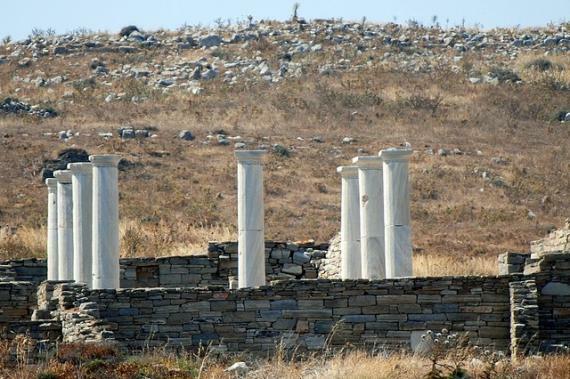 Very close to Mykonos are Delos and Rinia two visitable islands with archaeological interest. Its area amounts to 88 km² while the coastal line reaches 88.7 km. Although there are no mountains here, the island is not flat and has rocky outcrops, with the highest peak the Prophet Elias Vornioti in altitude 372 meters. But that's all with the numbers! Mykonos is a top tourist destination, renowned for its cosmopolitan character and its intense nightlife. 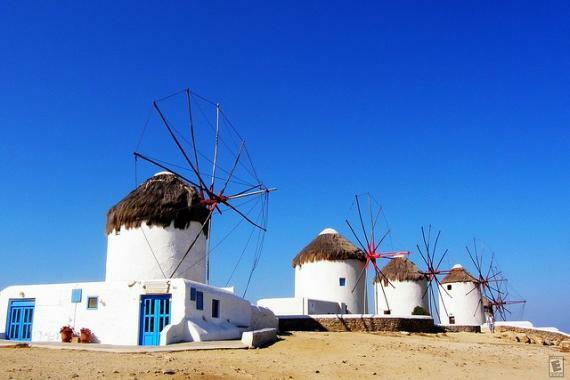 The beauty of the island is a combination of the white houses, the narrow streets, the churches, the windmills, the blue sky, the hot sun and the crystal clear sea water. Mykonos is a resort of celebrities with a glow that touches all the visitors. Why not you too? The island is dry with little vegetation and few crops in areas where allowed by the stony ground. The climate on the island is mild Mediterranean, with little rainfall and sunshine many days of the year, while in summer, the winds (north, north-easterly winds in July and August) make the heat more bearable by keeping the island cool and that's why Mykonos is also named as the island of winds. The sea, the climate and the landscape, led to a large tourist development of the island with its economy based on this. Also is the unique elegance that the local market such as shops, restaurants and hotels are built and decorated. This is Mykonos full of light, hospitality of its people and plenty of choices for fun! Once, in the not so distant past, here was a beautiful and poor Cycladic island, where nature has endowed with splendid granite rocks and truly unique beauty of beaches. People struggled to survive and managed capably for many centuries. These characteristics charmed few decades ago the first wealthy western visitors, who soon made Mykonos one of the most popular travel destinations on the planet. If the bustling cosmopolitan atmosphere is what you desire, then Mykonos is the perfect island for you! Here you can party all day or you can relax by visiting the many beaches that are ideal for this purpose. You'll also have the opportunity to admire the archaeological sites and the various monuments of the island. Late summer is the most ideal time to visit Mykonos, but the island is gorgeous all the year. The main town is like something out of a painting, winding, beautiful streets filled with small shops and restaurants, art galleries, cafes, and coffee shops, while there are many traditionally-built houses and picturesque churches serving as a background. There are several ways to get to Mykonos. By boat or a cruise ship in the harbor, or by plane to land at the airport. Once you're there, there's plenty of public transportation to help you get around to any destination on the island! Buses, taxis, small boats, cars or motorcycles and, of course, by foot if you're feeling particularly adventurous and want to see the sights at your own pace. Home to plenty of attractions, Mykonos will never cease to entertain you. From the beautiful historic windmills, to churches such as the most impressive Byzantine church on the island, Virgin Paraportiani, to the small district of Little Venice, there are many wonders to be seen during your stay. Not to mention the plethora of museums, beaches, shopping centers and restaurants from one end of the island to the next. If it's nightlife you're looking for, Mykonos is home to several bars and clubs. There are bars in the town, bars on the beach- you can get your drink on in whichever setting makes you the most comfortable. For accommodations, you'll find plenty of hotels in all price ranges. There is also camping available. Telephone and internet are readily available all over the island as well, so you don't have to worry about keeping in contact with your loved ones. Mykonos also has a hospital and medical center, though the island is very safe and the most dangerous thing you should encounter is intoxicated drivers. Wear comfortable white clothes, tangle with the other visitors in the narrow streets and be part of an amazing journey! Welcome to Mykonos! Find information about selected Hotels, apartments and rooms in Mykonos and 5 star hotels in Mykonos to choose the perfect place for your accommodation.